What is a breath of air and where does it go? Every day our respiratory tract transports over 10,000 litres of air back and forth – the contents of one hundred bath tubs. With every breath we take our lungs deal with gigantic quantities of bacteria and microorganisms, fine dust and other air pollutants, and in most cases amazingly manage to remain in working order for our entire lives. And yet our lifestyles and the environment are endangering the function and integrity of our lungs to an extent that is true of few other organs. 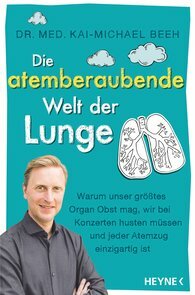 In this fascinating and entertaining book, lung specialist Kai-Michael Beeh tells us everything about our lungs, the amazing things they can do and how we can help them stay young and healthy.